The crash that took the life of Wayne Sanderson, 47, of Cheyenne, WY, was not caused by drugs or alcohol. Sanderson wore his seat belt and his brake lines were intact. What took Sanderson's life is one of the newest, but most dominant, killers on our nation's roads, Chex Mix. 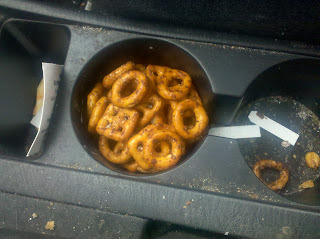 Specifically driving while eating Chex Mix and having to take one's eyes off the road to separate out the pretzels. The sheriff's office reportedly found a half empty bag of Bold Party Blend Chex Mix and a cupholder overflowing with the squared pretzels that go hand-in-hand with Chex Mix. Look at all that evil undelicious in one handful. 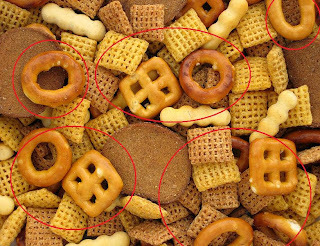 While exact numbers are hard to ascertain, it's estimated that roughly one in six accidents in America are caused as people try to separate out pretzels from Chex Mix. This makes it even more dangerous than texting teenage drivers running red lights while speeding and on cocaine cut with rat poison. “General Mills (producer of Chex Mix and Cinnamon Toast Crunch) is obviously beholden to some sort of pretzel lobbying group. Anyone with the basest level of taste would know to not combine something reviled with all the other bits of awesome in Chex Mix,” said Novak. In recent years, General Mills has added pretzels to items that were never intended to bear the salty awfulness of pretzels. While the limited edition “Muddy Buddy” variety correctly featured no pretzels, the 2011 seasonal hot cocoa variety featured thoroughly out of place pretzels amongst other bits of chocolatey delights. Sommers refused to answer any other direct questions about Chex Mix. The one bit of solace Sanderson's family can take away from this terrible ordeal is preliminary toxicology reports show his blood pretzel level was at three parts per thousand. While this is over the normal levels for people with taste, it can probably be attributed to inhaling the dust that had spread itself upon other parts of his Chex Mix. We can only hope that too, Maureen. We can only hope that too.